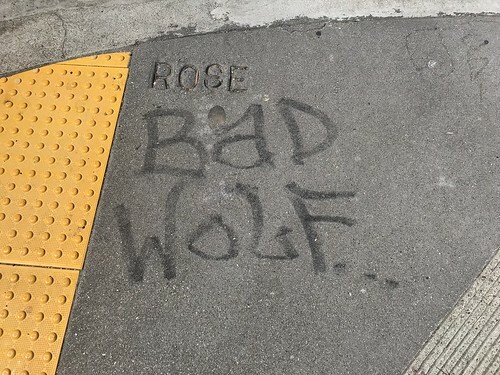 At the corner of Rose and Octavia, someone painted “Bad Wolf…” underneath the street imprint in the sidewalk. I thought that was pretty funny and snapped the above photo. Spoilers for old Doctor Who episodes follow. “Bad Wolf” was a storyline from the first season of the rebooted Doctor Who back in 2005. Throughout the season the ninth Doctor and his companion Rose Tyler keep seeing references to Bad Wolf, but are unable to identify the significance of the phrase. Toward the end of the season, Rose Tyler looks into the heart of the Doctor’s TARDIS and becomes temporarily inhabited by it or something. Look, this is all pretty convoluted even by Doctor Who standards so just roll with it. The important thing is, Rose Tyler with the TARDIS’ time traveling power becomes a new entity known as Bad Wolf. Together as one, they defeat a small army of Daleks and bring “Captain” Jack Harness back to life via time manipulation. A thirteen year old story from a BBC show isn’t what one would normally expect to see on the streets of San Francisco. Kudos to those keeping our streets humorous and geeky.